Tyler Futrell passes the ball just before a slide tackle attempt by a Dyer County player. Jesper Kemp uses his chest to get the ball under his control. Alex Cherry gains control of the ball with his foot. The Munford Cougars have taken a focused approach to each game this season. Head Coach Kyle Selby and Assistant Coach Bobby Picchi have challenged their players to focus on possessing the ball. With a goal of 75 percent possession rate and regaining control of the ball within 6 seconds, the Cougars have started 5-0. 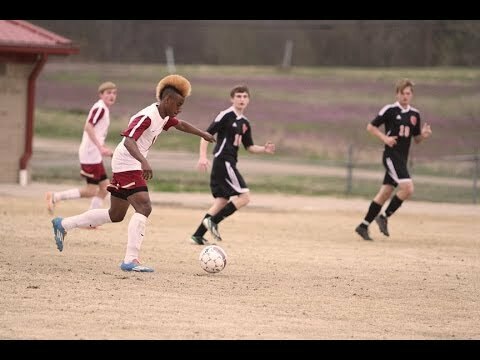 On March 31, Munford looked to improve to 6-0 welcoming District 13-3A foe the Dyer County Choctaws to Munford Stadium. Using their usual formula of possession and aggressive play in the goalie box, Munford dominated Dyer County for a 4-0 win. Munford took more than 20 shots on goal, meanwhile Cougar keeper Erik Furseth only saw four Choctaws’ attempts. Furseth, a Memphis signee, made a leaping save on one attempt to keep Dyer County scoreless. Munford was deadlocked 0-0 when that save was made by Furseth. Moments later the Cougars jumped ahead 1-0 when Jesper Kemp blasted a shot into the back of the net from 25 yards out. The tally became 2-0 when senior Jaylen Hill dribbled the ball through the Choctaw defense and located teammate Tyler Futrell. The senior did the rest of the work and got a shot past the Dyer County goalie to put Munford up 2-0 at halftime. Late in the second half the Cougars went ahead 3-0 when another senior Cedrick Williams used some creative moves to score his goal. The cherry was put on top for Munford when senior Alex Cherry blasted a goal from deep to make the final 4-0. “Good opportunities and the boys are playing well,” Selby said. “They’re doing some things we’ve asked them. We’re seeing some things out of them. You’re 6-0 but I feel we haven’t seen their best soccer yet. We’re starting to see glimpses of it.